This traditional counter height dining set in a lovely dark cherry finish is another great dining room option from RC Willey. The table has a unique feature with shelf below the table top providing additional storage a nice visual interest. It's perfect for entertaining and for everyday use. Includes table and four counter stools. 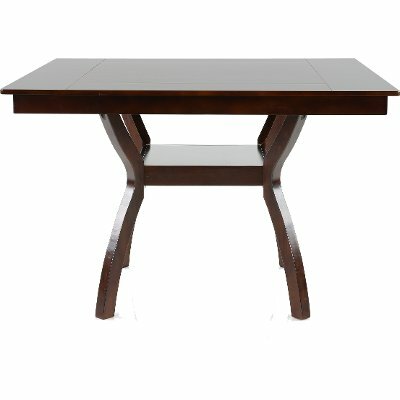 This traditional counter height table, now available at RC Willey, has the perfect dark cherry finish. It features a unique base with a shelf below the table top. The curved legs add to the statement and elegance of the table. It would look great in any home. Add a counter height stool to your space that is both functional and stylish with this dark cherry counter stool from RC Willey. The back features cut out design and is partially upholstered, making the chair that much more comfortable to sit in. It's also a chair that would look great in both formal and casual rooms. 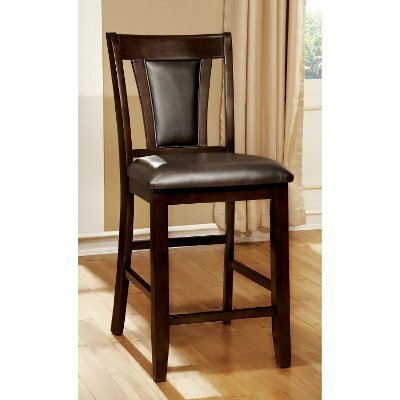 Dark Cherry 5 Piece Counter Height Dining Set - Brent is rated 2.0 out of 5 by 3. Rated 1 out of 5 by BewitchedOne Cheaply Made This product is extremely unstable. The table is unbalanced and too top heavy for the center stand. It does not stay well onto the table legs. Wobbles all the time. The chair rungs break easily and the chairs themselves are too heavy. Rated 1 out of 5 by dissapointedshopper Table looks great but quality is bad Top of table to heavy for legs so it is not sturdy. Quality of wood is not the same as in show room. Would not recommend this table because of that. Rated 4 out of 5 by Shopgrl Love this dining set I've been looking for a dining set and this one was perfect. Chairs are very comfortable. The shelf under is different from most. Very happy with my purchase.